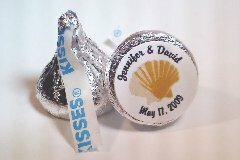 Personalized Hershey Kiss Stickers for Your Special Occasion! 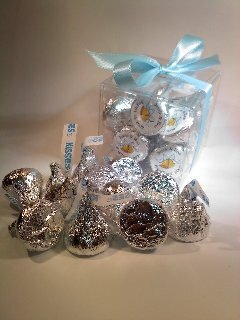 Whatever your occasion--Personalized Chocolate Kisses add sweetness! either design number is OK to use. If no font is noted, we will use the font on the design number ordered. NOTE: * * * * * * * * * * * * * * * * * * * * * * * Shopping cart unit price and shipping will NOT be correct. 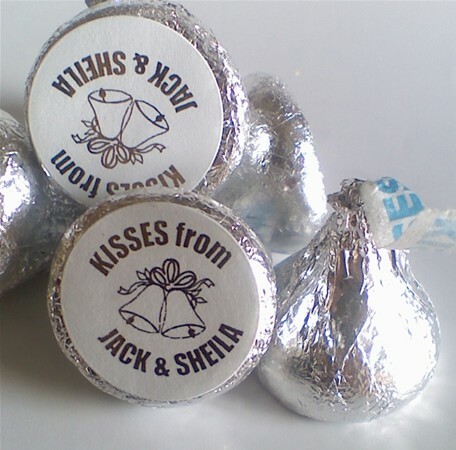 Stickers to personalize Hershey Kisses. Shopping cart unit price and shipping will NOT be correct. Small: Holds 5 or 6 pcs. .75 " or 1" Round Please specify in Note Section of shopping cart which size you want. If no note is made .75 (Kiss Sticker Size) will be sent. Specify Personalization details in note section. We will send an email with a revised total for RUSH orders. choose several graphics to split your order with. Based on Quantity, Zone and Temperature. we will call or email you before finalizing your order. Please call us to discuss Hershey Miniature options. 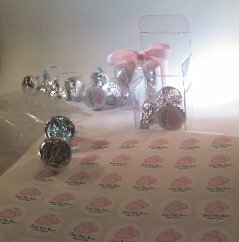 15% Discount on Mini Wrappers when coordinating with round stickers! Shipping Over 1000, price will be quoted based on quantity and zone. Shipping on orders with chocolate, price to be quoted--typically up to 300 pcs $9.85 - $13.85. Can you personalize that little thing that sticks out of the kisses? Hershey calls that little tab, the plume. Unfortunately, we cannot personalized that. We are working on a LARGE chocolate (2oz.) that we may be able to personalize! Click here for more information and a picture. How much information can I print on the KISSkers? Well, they are only .75" in diameter, so there isn't a tremendous amount of room. Just enough to be cute and to the point for the occasion! 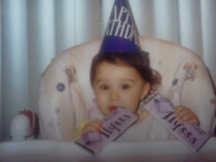 Do you know where I can also get personalized chocolate bar favors to match? Can I proof before I place my order? Unfortunately we cannot provide proofs before an order is placed. Once your order is placed, we can send one proof. We can only send proof based on one design choice. If you are not happy with it, we will make changes based on your original design number and will change colors, fonts and verbiage.. If you change the design number completely, there is a $5.00 set up fee per design changed. Can I get a printed proof? Yes. Printed proofs are $5.00 to process and send you the samples via 1st Class mail. If you need overnight shipping of the proof, overnight charges are added. These can be any where from $9.95 to $20.00 depending on your location. We ship from New Jersey. Can you match my colors exactly? We do our best to color match. Colors may NOT match in print what you see on the screen. This is just a general idea for color. If color match is crucial, you will need to provide a swatch of the color. There is a $5.00 charge to color match swatches. Should we crop the photo? Your best bet is to let us crop the photo. There needs to be enough room around the photo to ensure it fits properly in the photo. Everything inside the yellow circles is what will print. If you crop the photo too close to the faces, there will be 'white' around the image. Below is the 'round' version. (Enlarged for clarity. Black outline does not print. not printed and/or shipped the stickers--we can cancel the order at no charge. Once we have sent you a proof, or begin work on your order, there is a $8.00 cancellation fee. If we have printed or mailed your order we cannot cancel the order. If we have not shipped, we can give a credit for shipping, if you do not want the stickers sent. Can these dots be used for New Babies? There is not much room to put all the birth information, but we can certainly put baby's name and date of birth along with a baby graphic. Can these dots be used for ...? What ever you want...! They are great for personalizing anything and everything! They come in sizes .75" and 1" round. Ask about other sizes too! How will my personalized KISS Stickers arrive? Stickers are sent via Priority Mail which will be delivered 2-3 days after your order ships. You should receive your order within 7-10 days. If you need them sooner, please let us know when you need them by and we will accommodate you if we can. Will you give a refund on orders that are not received on time? with you, we will refund shipping costs only - if the carrier does not fulfill their delivery guarantee without just cause. US Priority mail does not offer guarantee, so we cannot refund shipping for orders shipped via Priority mail. Rush order fees will not be refunded for orders that were shipped on time. If the package does not arrive on time, PLEASE DO NOT REFUSE THE PACKAGE FROM UPS. (or are not available to accept the package and they are not able to deliver it). Your order constitutes agreement of all terms on this website. Additionally, UPS charges a $10.00 address correction fee when an address change must be made. This charge will be invoiced and charged to you. How come every sticker is not perfectly centered? Unfortunately, not every sticker lines up perfectly centered. Though some are off centered, they still look great! Do I have to use these only for Hershey Kisses? No! Use them for a variety of things! Envelope seals, calendar stickers, on items that are sent to day care, on lunch bags, lollipops, etc. Ask about our other sizes too! Yes, we can ship STICKERS ONLY. Sorry, no candy. Shipping must be calculated based on your location. Shipping is typically $16.85 - $25.85 based on the country and zone.. Transit time 6-10 days. However, there is NO guarantee on time unless we ship with an expedited method. Email us for a quote. Be sure to include your exact shipping address. We do purchase a 'Certificate of Mailing' which shows we have shipped the package to your address. Unfortunately, because we have no control over the delivery once it leaves our office we cannot be responsible if it is not delivered and we cannot issue a refund or replacements. Ordering for delivery out of USA is at your own risk. However, we have only had one instance where the wrappers never showed up in over 10 years of business! in the total and will be your responsibility to pay. Why does it cost $5.00 to ship a few sheets of labels? We do understand that $5.00 may seem high to ship a few sheets of labels, however this is our shipping rate for a few reasons. The main reason is because some people have put in claims that they have not received the labels when we sent via first class mail, so we no longer will ship with a method that does not have Delivery Confirmation. (We felt people were being dishonest) For those who are shipping a larger quantity and / or to a farther distance, the weight and cost of the shipping would vary, so we chose to use US Priority mail - flat rate envelope because they provide a 1-3 day transit time, which is quickest to all areas of the US. Additionally, the cardboard envelope of the Envelope that USPS offers, does provide more protection than regular envelopes. Since US Priority Flat Rate Envelope cost around $5.00, we felt that was the best method, for both economical and speed for the product to be delivered. We like to have quick turn around time from when the order is placed until it is delivered to your door. When your order is received, it usually gets processed within 1-3 business days so it should arrive to you in 3-7 days. Do you have LARGE Kisses? If you are interested, PLEASE call or email us (wrapperfavors@aol.com) and let us know you would like more info! The more interest, the sooner the project will come into fruition. *NOT Hershey chocolate. Would be made with a high quality Milk Chocolate coating. Monday - Friday 9-4 pm Est. Closed Saturday and Sunday (but we check email 7 days a week).